Geothermal Energy Market size for 2016 was valued over USD 34 billion and is set to exceed 23 GW by 2024. Increasing electricity demand from off grid remote location coupled with rapid industrialization across developing countries will drive the global geothermal energy market. In Middle East electricity consumption was reached from 840 TWh in 2013 to 935 TWh in 2015. Ability to offer high thermal efficiency, reliability, stability, robustness, and baseload power will make its adoption favorable over other alternatives. Growing energy security concern due to rapid fossil fuel depletion will propel the geothermal energy market. Policy makers have introduced several initiatives including FIT, financial assistance, tax credit, and renewable portfolio standards to encourage the deployment of renewable energy resources which will further complement the industry landscape. In 2016, Government of Turkey introduced FIT and early stage geothermal support program in collaboration with European Bank for Reconstruction and development. Stringent government regulation to curb carbon footprints will stimulate the geothermal energy market. In 2017, Germany set a target to reduce greenhouse gas emission by 40% by 2020 and 95% by 2050 from 1990 level under climate action program. It also aims to increase the renewable share in gross final energy consumption to 60% by 2050. Technological advancement to enhance the renewable resource utilization will further augment the industry landscape. Long lead time along with high capital cost required for building a plant may hamper geothermal energy market. Binary geothermal energy market is predicted to expand over 9% owing to its cost-effective conversion features. It finds wide application across low temperature regions. The plant comprised of organic rankine cycle which use organic fluid to recover heat from low temperature heat source. In 2015, Japan based Idemitsu Kosan announced the development of 5 MW binary plant which is expected to be operational by 2017. 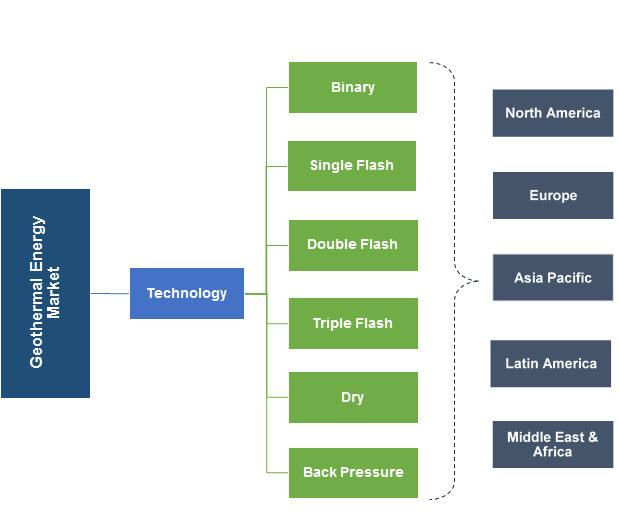 Flash geothermal energy market is anticipated to witness a significant growth due to its growing application across the high temperature region. Double flash is preferable over single flash owing to its ability to enhance power output by 19.97%. In 2017, Sumitomo announced to invest USD 630 million to construct 80 MW of Muara Laboh power project in Indonesia. The project is expected to reduce 1.7 Mt carbon emission and to generate 1.73 million MWh electricity every year. Ability to generate electricity by utilizing dry steam will stimulate dry geothermal energy market. It finds wide application in high volcanic mountain area. The U.S. geothermal energy market size for 2016 was over 2 GW. Increasing clean electricity demand coupled growing emission reduction measures will facilitate the industry growth. In 2015, the U.S. EPA introduced New Source Performance Standards under section 111 of clean air act to limit carbon dioxide gas emissions. Ease of availability for shallow ground temperature throughout the country may further complement the industry landscape. Increasing government and private funding to develop the country’s untapped energy sources will propel the Indonesia geothermal energy market. In 2015, Government of Indonesia set target to achieve 100% electrification by 2020. The country is also aiming to increase renewable energy utilization to at least 23% by 2025 under which geothermal accounted for 88%. Turkey geothermal energy market share is predicted to expand over 2% by 2024.Favorable government policies to encourage the adoption of renewable energy resources will stimulate the industry growth. In 2016, Government of Turkey and European Bank for Reconstruction and Development has introduced USD 125 million PLUTO initiatives to develop five geothermal power plants with generating capacity of over 450 GWh per year. Positive outlook towards horticultural sector will further complement the industry landscape. Growing electricity demand along with abundant availability of untapped resources will positively impact Ethiopia geothermal energy market. In 2014, approximately 73 million people were having lack of electricity access across the country. Increasing investment towards the development of green building infrastructure coupled with rising demand for cooling and heating system will positively impact the Germany geothermal energy market. Introduction of directives including energy performance of building to ensure that all the new buildings will be zero emission building by 2020 will raise investments towards green building infrastructure. 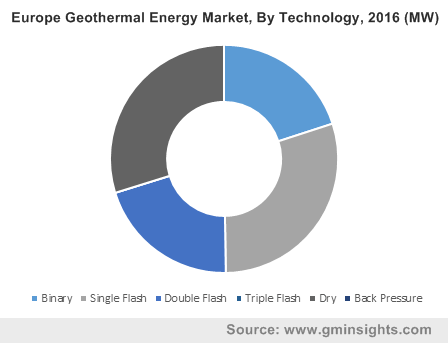 Key players in geothermal energy market are Ormat, Terra Gen, Mitsubishi heavy industry, Toshiba, Fuji Electric, Ansaldo Energia, Turboden, General Electric, TAS Energy, U.S. Geothermal, Exergy, Chevron, Haliburton, Reykjavik geothermal, Enel Green Power, and Calpine. Several mergers and JV strategy has been witnessed in the industry to increase its regional presence. In February 2017, Haliburton and state based utility PLN signed an agreement of worth around USD 34 million to drill geothermal wells in North Maluku, Tulehu and Ambon. The company also set target to increase its investment in renewable sector by USD 1.56 billion in 2017 from USD 1.37 billion. It is clean, sustainable, cost effective and reliable energy resource for electricity generation. It can be found into shallow ground to hot water, hot rock or into earth’s interior owing to availability of high pressure and temperature of molten rock. In the U.S., mostly hot water geothermal reservoirs are found in Hawaii, western states and Alaska. It offers 30% to 60% saving on heating and 20% to 50% on cooling. High upfront cost, lack of financial support and location constrain may hamper the geothermal energy market.